The Very Best finds its muse in a resale shop. “I was living just one block down from Esau’s furniture shop,” Johan Karlberg says. 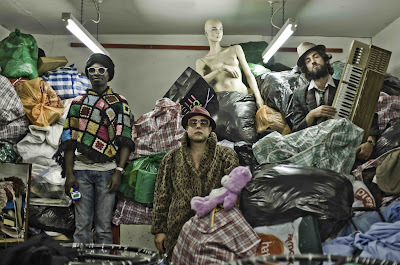 One half of London-based ghetto-pop outfit Radioclit, Karlberg is the main producer behind the Very Best, an Afrocentric collaboration with his production partner Etienne Tron and Malawian-born secondhand-furniture-store owner Esau Mwamwaya. “Etienne lived five blocks up, so he’d walk past the shop everyday coming to my studio.” To shorten his trips, Tron purchased a bike from the jovial shopkeeper; the two instantly hit it off. Soon, Tron invited Mwamwaya to Karlberg’s studio, and the trio’s fruitful relationship was born. Since last year’s promotional mix-tape, Esau Mwamwaya and Radioclit Are the Very Best, the group has seen a torrent of critical praise. The collection comprises famous instrumentals—including tracks from M.I.A., Vampire Weekend and Michael Jackson’s Free Willy theme, “Will You Be There”—over which Mwamwaya sings in his native Chichewa as well as Swahili, Portuguese and English. The Fader magazine and Pitchfork hailed the mix as one of the year’s best releases. In subsequent weeks, its downloads skyrocketed to more than 200,000. For Karlberg, the group’s 27-year-old, blond-bearded spokesman, and Tron, 28, the Very Best’s seeds took root a few years before the fateful furniture-store encounter. “I started photographing in my early teenage years,” Karlberg says on the phone from the office of Green Owl, his label in New York. “I was also starting to make music in a rap group I had with my friends.” Born and raised in Linchoping, Sweden, a small town outside Stockholm, Karlberg followed his bandmates to London after graduating high school. “I stopped the photography—professionally at least—and the music slowly took over.” French expat Tron was working for Ninja Tune’s hip-hop offshoot Big Dada when, in 2003, mutual friends in the Parisian rap group TTC introduced him to Karlberg.